It's been awhile since I took the time to just write. Write what I'm feeling, how I'm doing... I write a lot about music lately (it seems), so I figured 'd take some time, give myself some therapy, and maybe help some of you out in the process. The other day, I was frustrated at work. (We all have those moments.) I didn't understand why something was happening, and one of my producers, Vanessa, advised me on what I should do. I did it. (Hang in there, I know this is vague, but there is a point.) So I did as she suggested, and ended up receiving some great feedback; the problem was solved, and all was well. And all I had to do was send a measily email that took me about 5 minutes to construct, re-read and press send on. And then I wasn't frustrated anymore. She ended up telling me afterwards, "See? Sometimes people just want to feel like they've been heard." This is the God's honest truth, and I feel like we could create world peace if everyone took the time to make someone else feel like they're ideas are being heard, are being noticed, and mostly just being taken into consideration. 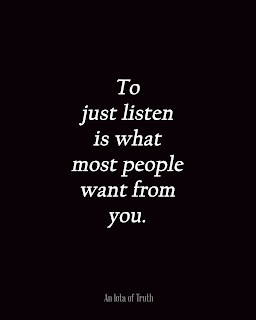 Everyone prides themselves on being a great listener. But are you actively showing other that quality? 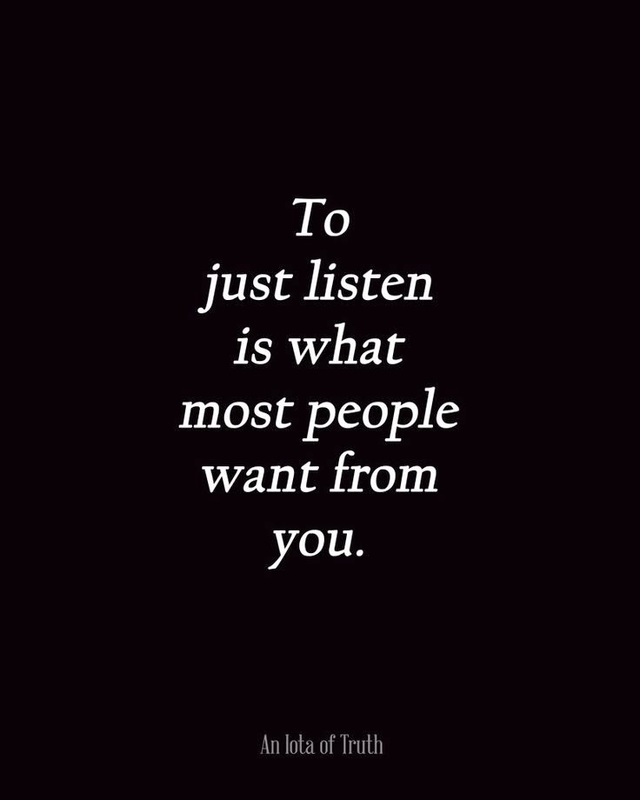 Listening is one of those things that requires some kind of action to really prove that you've been heard. Let's say you've complained about the toliet paper and how it's never replaced and that the empty roll just sits there. And your family says, time after time, "yes, we hear you, we will refill the toliet paper," but then they don't actually do it... you're going to feel as if you're not being heard. And moreso, that you're not getting respect. (Sorry for the lousy example but this always hacks me off — seriously, REFILL THE TOLIET PAPER. IT'S NOT GOING TO CAUSE BRAIN DAMAGE.) However, if you complain about it and then never experience an empty toilet paper roll again, you're like, "that's right! They get me." The action is what makes you feel like you've accomplished something. So, I guess what I'm trying to say here is this: maybe you don't see someone eye to eye on something. Perhaps it's your boss, your mother or your boyfriend. Maybe it's your client. Whoever it is, don't write them off. Give them the respect that they deserve as a human being, and make them feel like they've been heard. Even if they're being difficult, wow them by sending a re-written pitch or show up 15 minutes early to make sure their coffee is waiting for them. It can be as easy as sending a follow up email, in my case. Ultimately, everyone wants to feel like they have ideas that are appreciated, thoughts that are considered, and a voice that is heard. So give it to them. Don't you want the same in return?